The opportunities for winter vacations and winter sports are great in Central Rhodopes, Pirin, Rila, Gabrovo region. 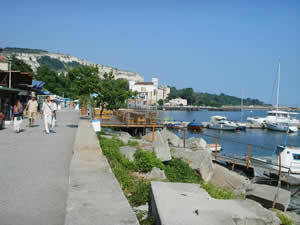 Balchik (about 12 000 population) is a charming town, located 47 km north of Varna city. It is like an amphitheatre on the very seashore. 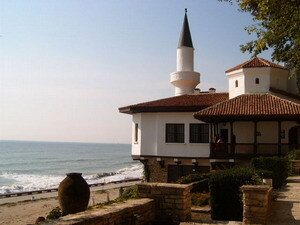 The Royal Palace, the Botanical garden, the churches, the Museum of History together with many other attractions make Balchik one of the most visited resorts on the Black sea coast. 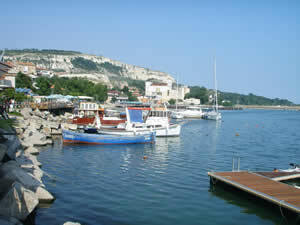 The Balchik port played an important role in the town's development, being the third sea-side port in terms of significance after the ones in Varna and Burgas. 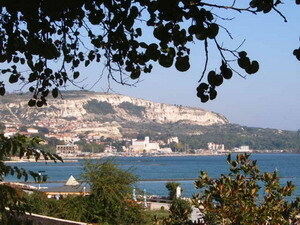 The unique nature and the ancient history make the today's romantic charm of Balchik - a constant source of inspiration for artists, poets and artists. The official name of the palace was the Quiet Nest Palace. 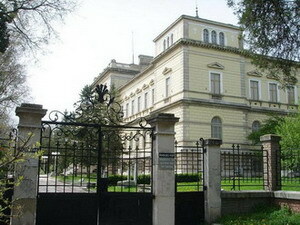 It was constructed between 1926 and 1937, during the Romanian rule of the region, for the needs of Queen Maria of Romania. Attracted by the beauty and the romanticism of the seaside town, inspired by the centuries-old trees, the wild flowers and the bird species in the region,Queen Maria of Romania selected Balchik to build her summer residence. The palace complex consists of a number of residential villas, a smoking hall, a wine cellar, a power station, a monastery, a holy spring, a chapel and many other buildings, as well as most notably a park that is today a state-run botanical garden. 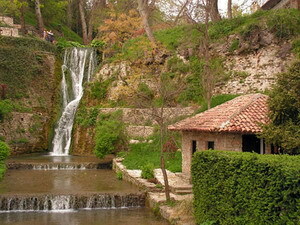 In 1955 the Balchik Botanical Garden was established at the place of the palace's park. It has an area of 65,000 m2 and accommodates 2000 plant species. One of the garden's main attractions is the collection of large-sized cactus species arranged outdoors on 1000 m2. 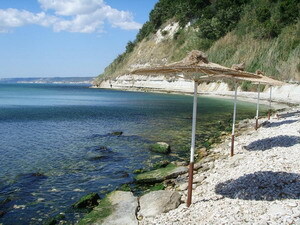 The mussels farm "Dalboka" north of Kavarna town and about 20 km north from Balchik town. 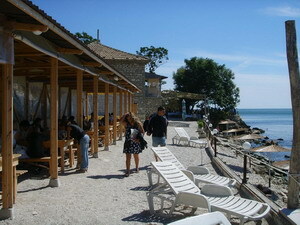 The restaurant itself is located just on the sea shore between Kavarna town and a small village, named Balgarevo. It offers seafood and great mussels from a farm, which you can see from your table, while enjoying the picturesque nature. Due to the popularity of the mussels farm Dalboka , it is highly recommended not to go there without having booked a table in advance. Otherwise, you will enjoy the views only, but not the food. "BM Korona" Restaurant in Balchik is a restaurant not to be missed, not only because it is just 5 steps away from the sea shore, but because it is surrounded by history, beauty and calmness, which makes it a wonderful place to enjoy a dinner with friends and family. Wherever you turn an astonishing view reveals the vast sea, the unique charm of the Botanical garden and the exotic palace of the Romanian queen. 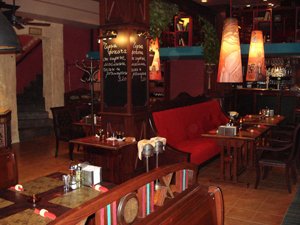 As a brand of the BM restaurant Chain, established in 1997 year, this cozy place opened doors at June 2007 and will definitely surprise its guests with a list of selected receipts from the Bulgarian and European cuisine, giving particular attention t the sea specialties and the salads, always fresh and tempting. As a bonus come the sunset and the white curtains decorating the Roman marbel columns. 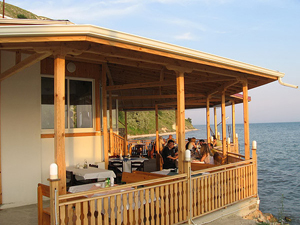 Kavatzi Restaurant in Balchik town - if you have choosen Balchik as a holiday destination or just want to spend a nice time during the weekends, this restaurant will welcome you with a delicious lunch or just a cup of coffee. 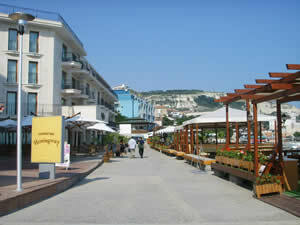 The ourdoor terrace goes into the sea and opens a calming view towards the yacht port and the Balchik bay. During the summer nights a band brings additionally to the clients' good mood. 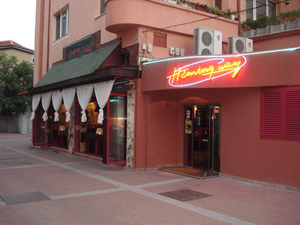 Maybe one of the best restaurants in Balchik town - Hemingway in Marina city complex is located just a step away from the sea. During the summer you might have a table just above the sea on the open air terrace. A fish dish or some of the sea food specialities will appease your hunger, while the gorgeous sea views are calming your spirit and recharging your battery. Some of the delicacies of the season are octopus, shrimps, caviar and a lot more sea surprises. 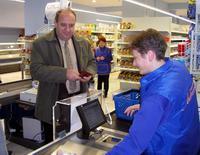 "Akvilon" supermarket the biggest and best supplied food and drinks shop in Balchik town. Located in the residential area "Balik", it offers reasonable rates and good service quality. It is the perfect place to make the weekend shopping, as in close proximity there is a small fruit and vegetable market, where you will find organic food and very often - home produced goods, which are distinguished by its unbelievable taste. 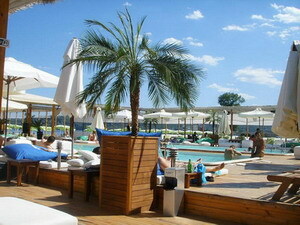 - Varna starts from 06:30 until 18:30, every one hour. 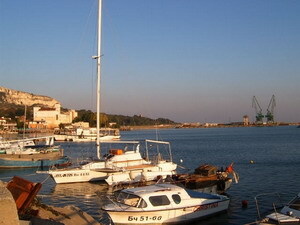 - Dobrich - starts from 07:15 until 18:30, every 45 min. - Albena - starts from 07:30 until 22:30, every 20 min summer schedule departs from "Ribarski" square. This local bus line is a great convenince for those who stay in the villa area between Albena and Balchik town, as it ensures a regular transportation. 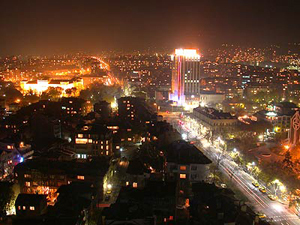 Varna is one of the oldest and most beautiful Bulgarian cities. Stretching along the Bay of Varna, with a total length of over 11 km, the city reveals splendid views towards the sea and the Varna canal. For centuries, this was a great and beautiful city to live in. Starting as early as the Ancient Greeks, this place has lured many, not only drawn by the sea, but also by the richness of the land, the great number of forests, miles long sandy beaches and of course the friendliness of the people. Keeping the city young and always up to date are the thousands students in Varna. The city has five universities and two colleges, which alone make a total number of over 60 000 young people. Laying down at the beach, shopping, or dancing till the break of dawn - what ever you choose to do in Varna it will be cheap, unforgettable, fun and exciting. A religious temple for the citizens, a must-see for the tourists, the Cathedral of the Holy Mother beyond any doubt is one of the symbols of Varna. The foundation stone was laid by Bulgarian Knyaz Alexander on 22 August 1880 after a solemn ceremony and prayer in front of a crowd of Bulgarians and Armenians. Interestingly, the Knyaz gave amnesty to all the local prisoners that had three months or less left to spend in prison. 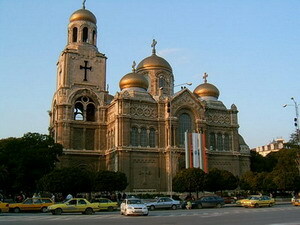 Officially opened on 30 August 1886, ever since the cathedral attracts the city visitors' admiration and respect. 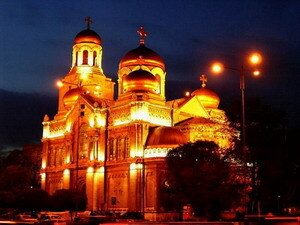 Few years ago together with few architectural monuments and sights of Varna, it has been illuminated, which gave the cathedral and the city additional brightness and majesty. Once you overcome the 133 narrow winding steps of the bell-tower you will be rewarded by the magnificent view over the city. 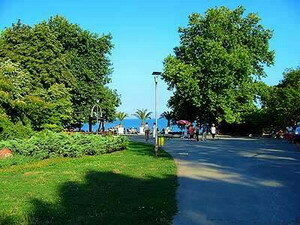 The Sea garden in Varna is the place for your complete relaxation all year round amidst the vast green areas, camling sea views, neat cafes and small restaurants. 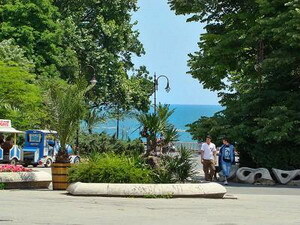 The Sea garden in Varna is spreading along the whole coast, giving the city a nice fresh touch and magnificent charm. Even during the cold winter and autumn months, the garden keeps its strength of attraction. Dated since XIX century, the first initiative for building a huge and contemporary city park was undertook by the city mayor Mihail Koloni in 1881. About 13 years later the well known Czech garden architecture Anton Novak was invited by the municipality to expand the park and to give it the nowadays look. 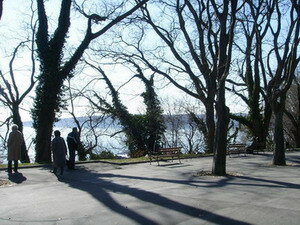 Not long time afterwards the Sea garden was known as the most beautiful park on the Balkans. In 1908 young citizens established a committee, which prime goal was building an alley of the Bulgarian National Revival. The following 3 years the monuments of Vasil Levski, Hristo Botev, Georgi Rakovski, Luiben Karavelov and a lot more national heroes have been raised. 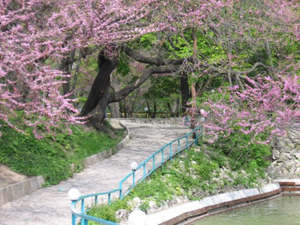 Having such a long historic background, the Sea garden nowadays stands for one of the most valuable and enjoyable symbols of Varna city, being host to many cultural and entertainment happenings in the city. 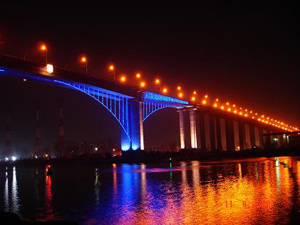 Part of the highway “Black sea” and the international road E-87, Asparuhovo Bridge, is not only an important transport connection between the North and South coast line, but it has become a distinguishing feature of Varna city. The impressive facts about Asparuhovo bridge are: 2050 m lenght, 50 m height, 21 m width, 53 m depth of the underground columns, resistance at hurricane wind - up to 180 km/h, resistance at temperature amplitude from - 40 degrees up to + 40 degrees, traffic - 10 000 transport units per 24 hours. The reason of its popularity in Bulgaria and abroad was the initiative of the local extreme sport club “Adrenalin” which founder performed the first bungee jump on 10 April 1992. 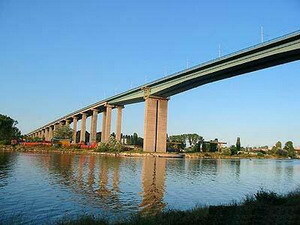 Ever since a lot of people gather on the bridge to test their courage and to experience the moment of their life. Aladja Monastery - it is the most famous rock monastery along the Bulgarian Black Sea Coast, 14 km away from Varna towards Golden sands resort. The cells of the monks and the chapel have been dug into the soft sandstone of the sheer rock, forming a group of caves. The predominating opinion of scholars is that the monastery was under the influence of a religious teaching that was in circulation in Byzantium and Bulgaria at that time. It taught about the energy of God - "isichasm" or "hesychasm". Visitors today can see in the high rock (40 metres) separate rooms of the monastery complex - the place of workshops, the chapel, a special church for requiescat (mass for the dead), tombs, the kitchen, the dining room, the cells of the monks and workrooms. They are all situated on two natural terraces, one above the other. In the past the church was richly decorated with wall paintings. Probably that is why the monastery was called Aladzha meaning "motley, multicoloured". In 17th - 18th century the monastery was abandoned by the monks. 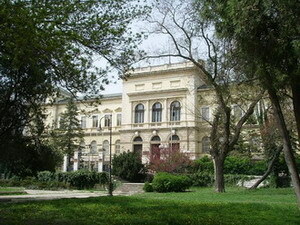 Archaeological museum in Varna - The beginning of the museum was laid by a group of public men and teachers from the Varna High School for Boys whose love for the historic past made them gather a small collection of archaeological monuments. On 12 December 1901 a group of public men and teachers established the Varna Archaeological Society which from then on for decades was the basic motive power for the interest and the study of the past of Varna, the Varna Region and Northeast Bulgaria. The inauguration of an archaeological museum was a task of prime importance for the Society. The idea came true as a result of the energetic collection and investigation activities. On 11 June 1906 the exhibition of the Museum was officially inaugurated in a room of the Girls' High School /now the Archaeological Museum/. 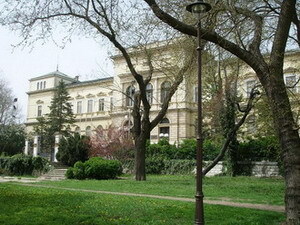 In 1945 the Varna Archaeological Museum was declared a state property. 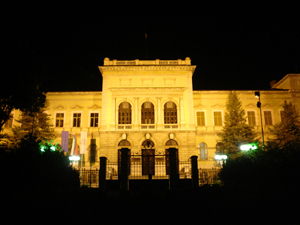 The rich collections of the Museum, the rich traditions in the investigation and collective work proved to be the main basis for creating some other museums in Varna city, such as the Navy Museum, the Ethnographic Museum, the Museum of the Bulgarian Revival, etc. 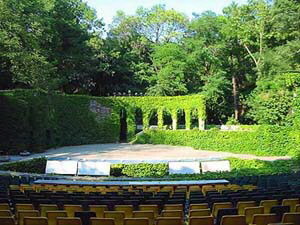 It stands to reason that Varna is a host to many international events such as The International Film Festival Love is folly. Usually held at the end of the most romantic month of August, the festval gives the city a special artistic glitter and unforgettable magic moments at the end of the summer. Already 15 years the festival gathers actors, movie critics, participants and a huge audience eager to experience the passion of the screen. With its great location just about 50 m from the Sea garden entrance, traditionally the Festival and Congress Centre in Varna welcomes all the guests of the film festival Love is folly. 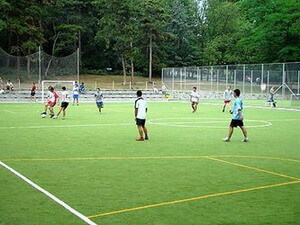 The open air Sport Complex in the sea garden is a place where to go out into fresh air with friends and at the same time to spend few enjoyable hours while training. Officially it was opened on 12 July 2006 and ever since the complex offers free entrance for the following sports football, basketball, volleyball and tennis. 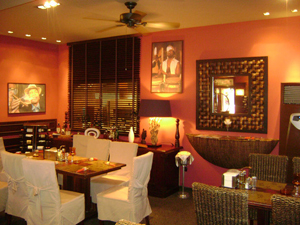 Due to the high demand and the fully booked hours, the reservation is required in advance. It is good to know, that observing the rules of the complex is one of the priorities of managing company and you might not be allowed to enter the sport complex, even if you are not proper equipped. 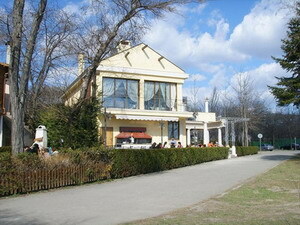 The Dolphinarium in Varna is an unique attraction not only for kids, but for their parents as well. 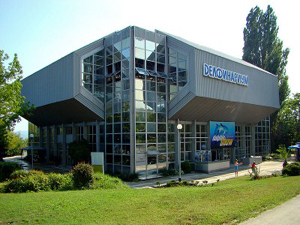 Built in 1984, with its 1134 seats in the presentation hall the Dolphinarium is one of its kind on the Balkan peninsula. The water needed for the pools is brought through a special duct and pumping installation from a distance of 80 metres in sea and at a depth of 3 6 metres, where the water is considered to be the clearest. During the 30-minutes program, the dolphins will charm you with their intelligence and impressive skills. In 1992 the first dolphin was born, which was a good sign, that these fabulous animals are already making themselves at home in Varna. 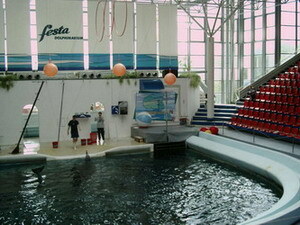 At visitors' disposal after the show is a pastry shop with huge underwater panoramic windows, revealing the live of the dolphins while having rest from the show. Monday is a day off for the dolphins. Address: Varna, 20 "Mihail Koloni" Str. Address: Varna, 76 , "Tsar Osvoboditel" Bul. Address: Varna, 11 "Iujen plaj" Str. Address: Varna, 7 "Radko Dimitrev"
Address: Varna, 27 "Opalchenska" Str. Address: Varna, 27 "Tsar Simeon" Str. 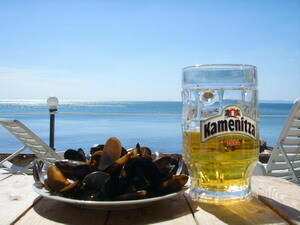 Address: 53 "Kniaz Boris" Str, Sevastopol Square - just next to "Black sea" Hotel. Address 1: Varna, 8 "Slivnitsa" Bul. Address 2: Varna 1 "Dragoman" Str. 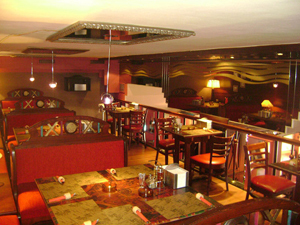 Address 3: Varna 11, "Preslav" Str. Address 4: Varna , 25 "Tsar Osvoboditel" Bul. Address 1: Varna, 66 "Kniaz Boris I "
Address 2: Varna, 37 A "Maria Luiza" Bul. 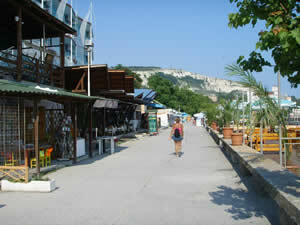 Address: Varna, 8 "Ioan Ekzarh" Str. Address: Varna, 4 A "Filaret" Str. Address: Varna, 25 "Tsar Osvoboditel" Bul.